Soljans Estate Winery is proud once again to present our annual Croatian Harvest Festival – Berba! Have you ever wanted to try making wine the old fashion way? With your feet? Come out to Soljans over the Easter weekend’s amazing three-day celebration and give it a go yourself. It is an incredibly fun experience for the whole family! We have grape stomping at 2:15pm daily over the Easter weekend and it is an opportunity not to be missed. Also don’t miss the chance to treat yourself to a well earned wine tasting at the cellar door, try new wines that have just been released and our refreshing “Novo Vino” (new wine) juice that has just started fermenting. 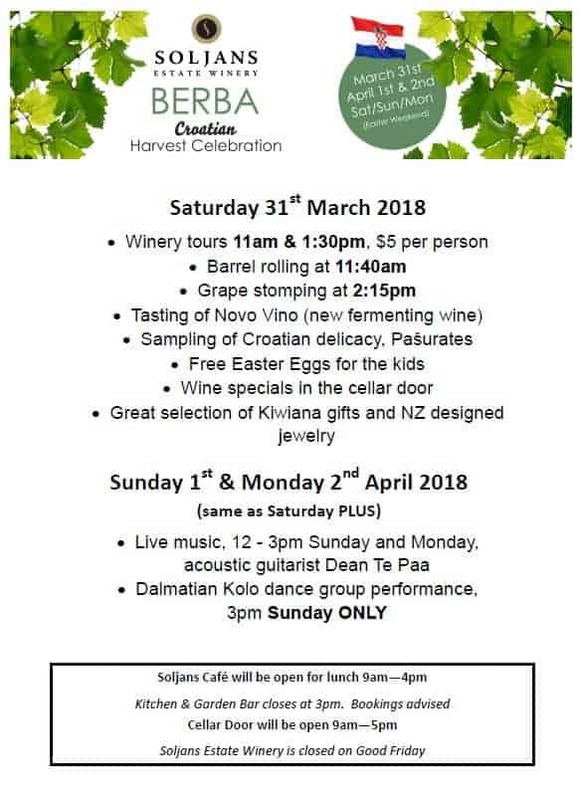 You can even join Tony Soljan himself for a winery tour – they will run all 3 days at 11am and 1:30pm, $5 per person (free of charge for kids). If you prefer to simply relax, you can take in the atmosphere in the award winning café and enjoy the seasonal fresh menu plus traditional style Croatian food platters and samples of the Croatian delicacy, Pašurates. Children can choose their favourites from their own menu in the café, enjoy the free Easter eggs and have their face painted. And just to put that extra swing in your step, watch Dalmatian Kolo dancers performing on Easter Sunday at 3pm and live music from 12pm-3pm daily under the newly built gazebo. Lunch bookings are advised. No Public Holiday Surcharge.